"If I could rest anywhere, it would be in Arkansas, where the men are of the real half-horse, half-alligator breed such as grows nowhere else on the face of the universal earth." Arkansas, officially "The Natural State", is a state of mountains, valleys, dense woodland and fertile plains. Its clear lakes and streams and abundant wildlife help to make tourism one of the state's most important industries. Arkansas became a state on June 15, 1836. In the early days of statehood, a couple of U.S. Senators had some disagreement on the spelling and pronunciation of Arkansas. One preferred to be called the senator from Arkan"saw" and the other preferred to be called the senator from Ar"Kansas". In 1881, the conflict was resolved when the state General Assembly passed a Concurrent Resolution No. 4 stating that the state's name was to be spelled "Arkansas" but pronounced Arkan"saw". The act was modified in 1947 to more specifically address the pronunciation of the state's name. Many place names in our state, including Arkansas, are French pronunciations of Indian words. At the time of the early French exploration, a tribe of Indians, the Quapaws, lived west of the Mississippi and north of the Arkansas River. The Quapaws, or OO-GAQ-PA, were also known as the downstream people, or UGAKHOPAG. The Algonkian-speaking Indians of the Ohio Valley called them the Arkansas, or "south wind." The state's name has been spelled several ways throughout history. In Marquette and Joliet's "Journal of 1673", the Indian name is spelled AKANSEA. In LaSalle's map a few years later, it's spelled ACANSA. A map based on the journey of La Harpe in 1718-1722 refers to the river as the ARKANSAS and to the Indians as LES AKANSAS. In about 1811, Captain Zebulon Pike, a noted explorer, spelled it ARKANSAW. During the early days of statehood, Arkansas' two U.S. Senators were divided on the spelling and pronunciation. One was always introduced as the senator from "ARkanSAW" and the other as the senator from "Ar-KANSAS." In 1881, the state's General Assembly passed a resolution declaring that the state's name should be spelled "Arkansas" but pronounced "Arkansaw." The pronunciation preserves the memory of the Indians who were the original inhabitants of our state, while the spelling clearly dictates the nationality of the French adventurers who first explored this area. Source: The Traveler's Guide to Arkansas . Arkansas is another form of Kansas and first appeared on a 1673 map of the region. The Kansas Indian tribe is a member of the Sioux nation. The Quapaw Indians lived west of the Mississippi River and north of the Arkansas River. The Quapaws were known as the "downstream people". Perhaps influenced, by French pronunciation of Indian names, the Algonkian-speaking Indians from the Ohio Valley called the Quapaws "Arkansas" meaning "south wind". Another large knife, made by Arkansas blacksmiths/knifesmiths and referred to as an Arkansas Toothpick, was similar in heft to a Bowie knife, but longer and designed for throwing. This is the earliest known nickname for Arkansas, first seen in print in 1858. Undoubtedly, Arkansas was referred to as The Bear State by early settlers who found the territory home to many bears. This nickname was pronounced, "Bar" State. People who live in or who come from Arkansas, are referred to as Arkansans (Ar"kansans"). This term is a throwback to an earlier pronunciation of the state name as Ar"Kansas." Can you think of a succinct name for state citizens using the Arkan"saw" pronunciation? William Jefferson Clinton: (Bill Clinton) was born in Hope, Arkansas on August 19, 1946 and served two terms (eight years) from 1993 to 2001. The Arkansas quarter is the fifth and final quarter of 2003, and the 25th in the 50 State Quarters® Program. Arkansas was admitted into the Union on June 15, 1836. Arkansas was acquired through the Louisiana Purchase and later became the Arkansas Territory before gaining statehood. The Arkansas quarter design bears the image of rice stalks, a diamond and a mallard gracefully flying above a lake. It is fitting that the "Natural State," Arkansas's official nickname, chose images of natural resources. 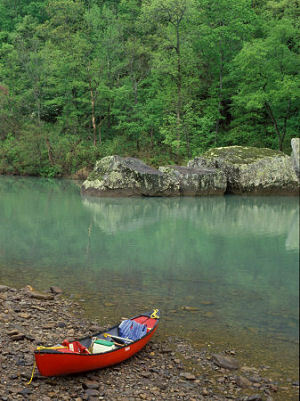 Arkansas has an abundance of clear streams, rivers and lakes. 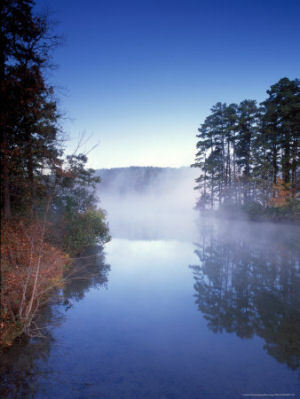 In fact, Arkansas has more than 600,000 acres of natural lakes. Arkansas is also known for its sportsmanship and boasts mallard hunting as a main attraction for hunters across the nation. Visitors to Arkansas can search Crater of Diamonds State Park for precious gems including, of course, diamonds. The mine at Crater of Diamonds State Park reportedly is the oldest diamond mine in North America, and the only one in the United States open to the public-visitors get to keep what they find. Visitors can also experience "Rice Fever" in Arkansas-just the way W.H. Fuller did when he grew the first commercially successful rice crop in Arkansas. Soon after, thousands of acres of the Grand Prairie were changed to cultivate rice, and Arkansas became the leading producer of the grain in the United States. In January 2001, Governor Mike Huckabee announced the Arkansas Quarter Challenge as a statewide competition. A two-week media tour promoting the Challenge resulted in 9,320 entries. After several rounds of elimination, the Governor forwarded three concepts to the United States Mint, including Arkansas' natural resources and the State Capitol building. The United States Mint provided four candidate designs based on the concepts to the Governor from which he chose the natural resources design. The following information was excerpted from the Arkansas Code , Title 1, Chapter 4, Section 1-4-105. Chapter 4 State Symbols, Motto, Etc. And, whereas, the matter has been thoroughly investigated by the State Historical Society and the Eclectic Society of Little Rock, which have agreed upon the correct pronunciation as derived from history and the early usage of the American immigrants. Arkansas (From Sea to Shining Sea) , by Ellen Macaulay. 80 pages. Publisher: Scholastic Library Publishing (September 2002) Reading level: Grades 3-5. Presents information about Arkansas' people, geography, history, landmarks, natural resources, government, state capitol, towns and cities, and more. Arkansas (World Almanac Library of the States) , by Darice Bailer. 48 pages. Gareth Stevens Publishing (October 2002) Reading level: Grades 4-6. Filled with the most up-to-date information, including the latest Census results. Full-color photos bring to life the story of Arkansas. In addition to an in-depth factual profile of Arkansas in the form of a state Almanac, this book offers fascinating and lively discussions of the state's history, people, geography, government, economy, culture, and lifestyles. A section on Notable People, a calendar of events, and enough primary source documents, time lines, maps, and other tools to make this unquestionably the best young adult reference material on the USA available anywhere. Roadside History of Arkansas , by Alan C. Paulson. 406 pages. Mountain Press Publishing Company (May 1, 1998) Roadside History of Arkansas explores how the Land of Opportunity went from success to tragedy and, finally, to hope restored. The narrative is enhanced by historical photographs and several easy-to-read maps that help visitors and residents understand what happened where and when. Readers will learn about Hernando de Soto's exploration of the Mississippi River, the grief of Native Americans forced to march west on the Trail of Tears, the humor and heroism of Davy Crockett, and Bill Clinton's rise to America's highest office. Organized around five regions--the Delta, or Mississippi Alluvial Plain, in the eastern lowlands; the Coastal Plain, which extends south through Texas; the Arkansas River Valley, slicing through the state's two highlands; the Ouachitas, the west central highland; and the Ozarks, a northern mountain range older than the Rockies--this roadside history explores the forces that drove the ebb and flow of Arkansas's past.